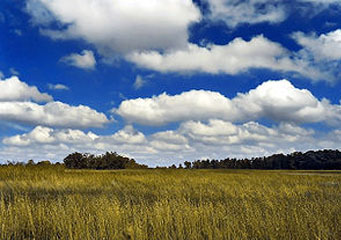 The cumulus clouds are among the most known structures and the easiest clouds to identify. In fact, their shape is so popular that if you were to ask an adult or a child to draw you a cloud, the picture will be a cumulus in an overwhelming percent of the cases. As their Latin name suggests, these structures take the form of a puffy or cotton like patterns and they give the impressions of an inflated or full shaped. Even though they can appear alone or clustered in certain formations, it is important to note that they are frequently precursors of other clouds. However, their transformation is usually dependant on the weather conditions, such as winds, instability, humidity level and temperature. How are cumulus clouds formed? These cloud structures develop due to a phenomenon that scientists term as ‘convection’, which is one of the most common methods of mass and heat transfer. To put it simple, the entire process depends on a front of warm air rising up in the lower atmosphere, where it cooled down at a rate of ten degrees Celsius for each kilometer of altitude. When the temperature is low enough to transform the water vapors into water droplets that is when the cumulous clouds are formed and take their specific shapes. Obviously, depending on the winds, temperature and the humidity levels, these structures will take on a certain outline. What height are the cumulus clouds found? It is important to note that these cloud structures are also referred to as tower clouds, meaning that they tend to stretch out far up into the atmosphere. However, the base of these clouds is usually situated at below two thousand meters above sea level. In addition, take note that the landscape plays an important role regarding the altitude at which the basis of the clouds can be found. Consequentially, along mountain chains where there are strong winds, the cumulus clouds can start forming at altitudes of over five or six thousand meters. How common are cumulus clouds? This low level type of clouds can develop almost anywhere on the globe, except the cold regions of Antarctica. In addition, these formations are also more common for the warm season, when the cold air outbreaks are most likely to appear. However, since they are transition clouds that are regularly enclosed in other cloud structures, they have a variable life span. Therefore, depending on their mass, the life time of a cumulus cloud fluctuates anywhere between five and forty minutes. On a side note, even though they are indicators of a fair and clear weather, they are also the principal responsible for the cold air front system. More exactly, they can grow into clouds that are known to produce precipitation and heavy storms.